Trained as a dancer and martial-artist at a young age, it is in 2000 that Samuka da Índia discovered Capoeira and started training under Mestre Branco (Group Ginga Nagô). While his path was later influenced by renown masters such as Mestre Curió, Mestre Lua Rasta, Mestre Preguiça & Nenel,… his heart stayed loyal to the Ginga Nagô group & Mestre Branco due to the integrity, openness and knowledge of this last one. 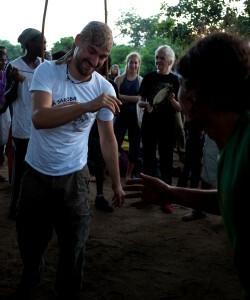 Initiator of the Auroville Capoeira project, he shares his knowledge of capoeira movement, tradition, music, Brazilian culture with the Auroville community continuously since 2007 keeping the tradition of capoeira alive and walking side by side with its evolution. Pioneer in the development of Capoeira in South India he started teaching Capoeira in Pondicherry in 2009 to later organize regular classes and events with La Casita (Cultural center for Latin-American culture). In March 2015, Samuka with the help of his students and the support of Mestre Branco officially created the group Ginga Saroba to formalize the existence of a body already in activity since over 8 years. The same year, Samuka graduated Capoeira Professor (highest graduation granted to a Capoeira teacher in India) during the annual event of Mestre Branco in Nantes (France). In 2016, Samuka and the Ginga Saroba group organized the first South Indian event to welcome a Capoeira master celebrating by the same the first venue of Mestre Branco in India. Samuka also became an active member of the Auroville Safety & Security Team, using his knowledge of Capoeira to train the guards & patrols in charge of maintaining peace inside the Auroville Township. His passion for Capoeira, music and handicraft also led him to start crafting musical instruments in 2009. 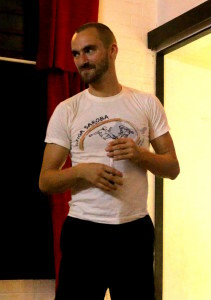 He started a collaboration with Svaram Musical Workshop in 2014 to produce under the brand SDI the full set of instruments needed for the Capoeira game (Atabaque, Pandeiro, Berimbau, Agogo, Reco-Reco).